Coworking is real. And it is beneficial too! With a lot of noise around coworking spaces, we thought of giving you a primer on the same. Read on to know the 360-degree basics and implications of this fast-growing trend that is ruling the office spaces and real estate market. Before we answer that, here is an interesting fact for you. If you work till you are 65 years, you are going to spend approximately 10-11 years of your life in office. Also, suppose you work for 30-40 hours of your approximate 168 -hour week in office for about 40-45 years of life, wouldn’t you want the office space to be enjoyable? 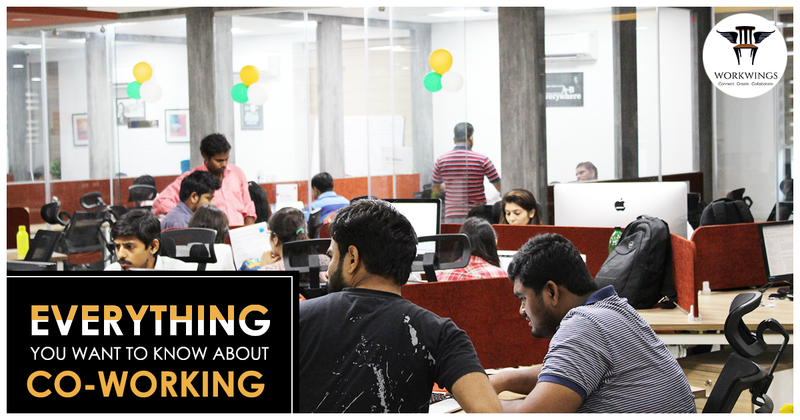 Coworking, as a concept was created a decade back. It originated from the fact we mentioned above – the amount of time people spend in their offices. This style of work involves a common shared work place. It is different from a typical office as the space is usually not employed by the same organization. What’s the big deal about coworking? A very important thing about the millennial generation is that they don’t have to be the so-called ‘professionals’ to start making a living. And that is one of the core strengths of coworking space. The diversity of the members of the coworking space is vast. Its members range from freelancer to remote workers to small business, accounting specialists to software developers to CEOs to designers to doctors etc. Coworking indeed is a place for anyone and everyone. These spaces are shared workspaces offering reasonable and affordable space for people who are looking to escape the loneliness of a home office or a coffee shop. These are swanky offices that offer a host of amenities like meeting rooms, cafeteria, hot-desks and much more. Apart from these amenities, these spaces provide a community and a sense of belongingness that is fast becoming an occupational hazard for people who work as freelancers or from remote places. The occupants work as small teams in a flexible space arrangement. Other than the culture, cost is also a big draw that attracts people to coworking spaces. A big advantage of such spaces is the provision to rent out what you need and not the entire office space, which is an expensive proposition. Most of these spaces offer different membership based models wherein the costs vary and provide a room for flexibility as per the needs and requirements of the occupants. If you want to know more about this uber cool phenomenon, check out Workwings. These images sums up the essence and importance of coworking spaces brilliantly. Once you do this, contact us if you are planning to set up your office or are expanding your team and looking for an extra space. We, at Workwings, will provide you the best workspace solution for your business.